In this era of technology, data in our computer like images, videos, project files, and documents are the most valuable asset and important part of our life. But, the way electronic devices store data aren’t perfect and losing data at any moment can happen to everyone. Today’s topic is to save you from the panic of losing data and the Best data recovery software of 2018 for you when your data has been accidentally deleted or lost. Data recovery software is a simple and user-friendly option to recover or undelete your lost data. However, every data recovery software is not useful and work effectively. Piriform developed and offered Recuva, one of the well-known publisher. You may know them by using CCleaner. It has a very simple and friendly user interface and easy to use. By using Recuva, you can recover lost data from hard disk, external hard drive, USB drive, CD/DVD or TF card. All you need to do is, download and install this program. Then from the menu, you can select the disk to scan and it will automatically find the deleted files. You can select or recover all your files and save to a new location. Recuva is one of the best recovery software out there and it has some advanced feature to recover your files, no matter where they are. EaseUS is another great data recovery software. The outstanding user interface and lots of useful option made this software my favorite. The windows explorer like user interface made it comfortable for most users. EaseUS Data Recovery Wizard allows you to recover files from hard drive, external drives, smartphone and almost anything that stores data. You can download and install EaseUS from their official It has the same features and almost same functionality like the Recuva and easy to navigate. Once you have successfully installed EaseUS, it’s a matter of time that you are going to get back your precious lost files. Power Data Recovery is offered by MiniTool and designed to recover all sorts of data. When it comes to corrupted data, lost data or damaged partition, Power Data Recovery solves the problems wisely. 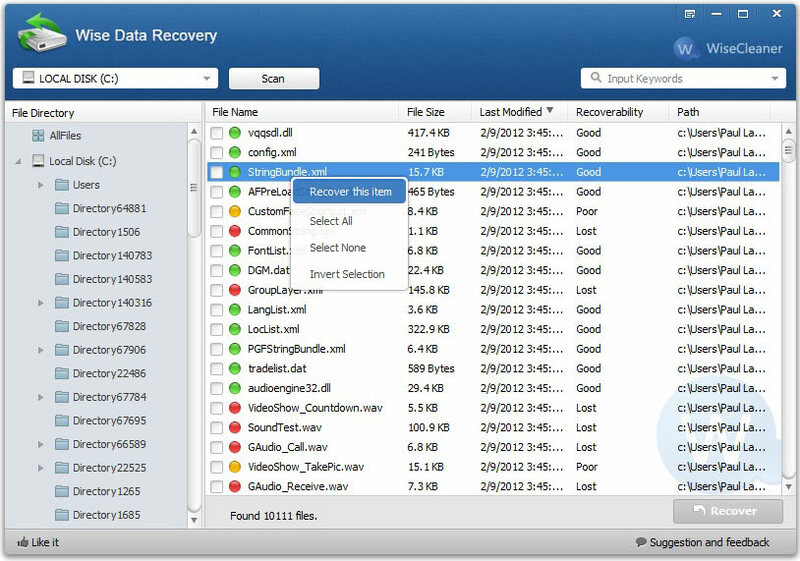 This one application is what you need when it comes to data recovery. The best part of this software is, it’s easy to use and you don’t need to learn a lot of technical stuff. The whole process is of recovering data is so simple and doesn’t require much effort. You can download Power Data Recovery and undelete the files you need from their official website. As the name suggests, Stellar Data Recovery performs a stellar job in recovering your data from your computer. If you are tired of trying so many data recovery software to recover your lost files without a better solution, Stellar Data Recovery tool is here to help you in an effective way. A safe data recovery software that recovers data from different types of storage devices like memory cards, smartphones, USB drives, hard disks etc. Wise Data Recovery is too easy to use and powerful data recovery software. It allows recovering all sorts of data from any type of hard drive. Wise Data Recovery has the fastest scan speed and shows a complete list of lost data from your drive. You can select all files at once to recover and save them to another partition or choose manually to recover.